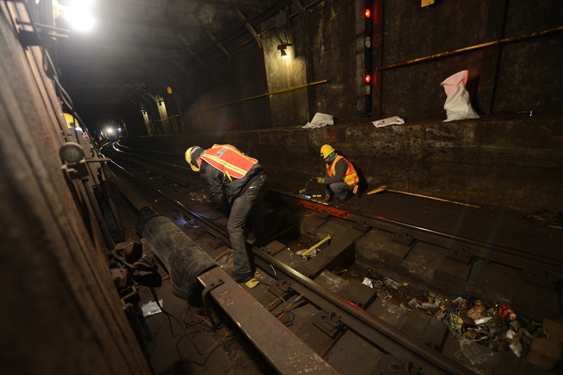 FASTRACK — MTA New York City Transit's aggressive maintenance program — came to the Pelham Line in Manhattan and the Bronx this week, part of a two-week maintenance effort for this line segment. 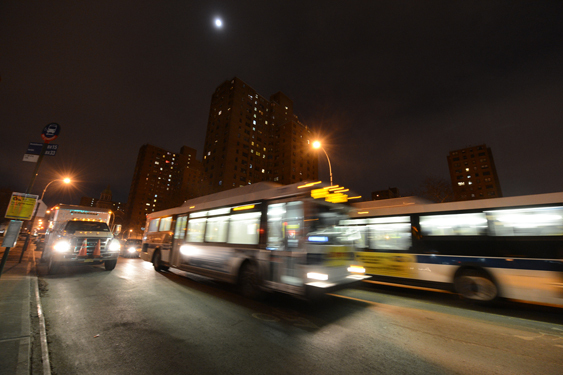 Subway service was suspended for three nights between Hunts Point Av in the Bronx and 125 St in Manhattan, from 10 PM to 5 AM. Free shuttle buses replaced the between Hunts Point Av and 125 St, providing customers with alternate service. Due to the severe weather conditions Wednesday, NYC Transit cancelled FASTRACK overnight Jan 7 to 8, meaning customers did not have to transfer to shuttle buses. 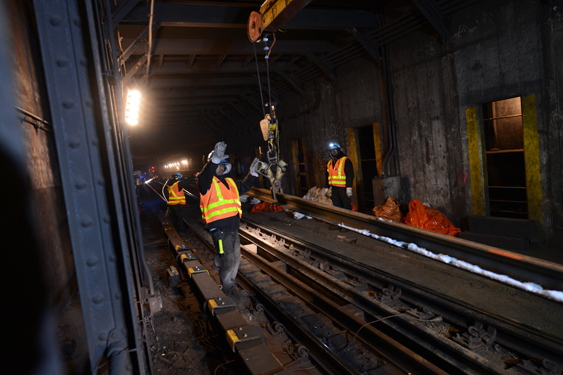 The other nights, NYC Transit employees performed a range of cleaning and maintenance tasks on signal equipment, track and third rail components, and station and tunnel infrastructure. Track – Scraped and cleaned 13,572 feet of track. Replaced 11 rails, 273 track plates, 192 friction pads, and seven tie blocks. Removed 56,140 pounds of scrap debris. 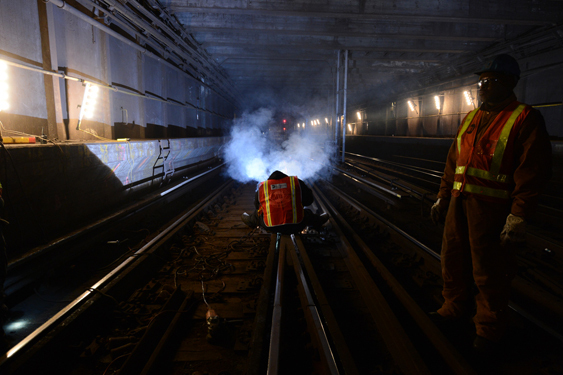 Third Rail Operations – Cleaned 1,820 feet of track under and around the third rail and corrected 167 defects. 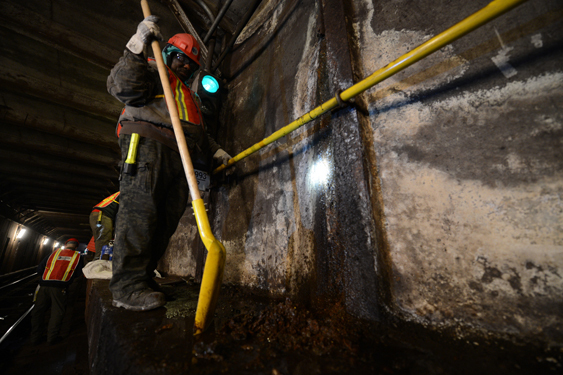 Infrastructure – Grouted 192 leaks and repaired 75 square feet of damaged concrete. Repaired 60 feet of bench wall. Changed 192 light bulbs. Repaired structural steel at eight locations. Performed pump plant maintenance, including the removal of 900 gallons of silt. Other tasks cleaning 16 muck drains and drip pan installation. 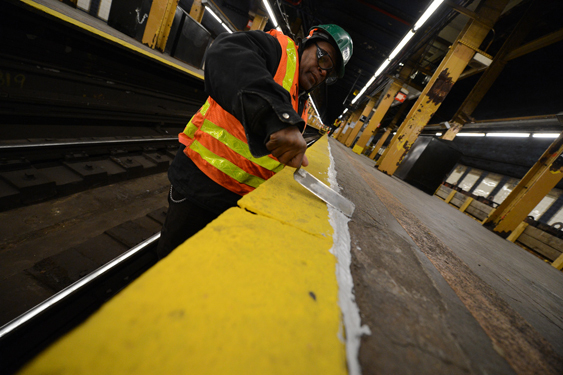 Station Environment – Scraped 3,540 square feet of station surface area. 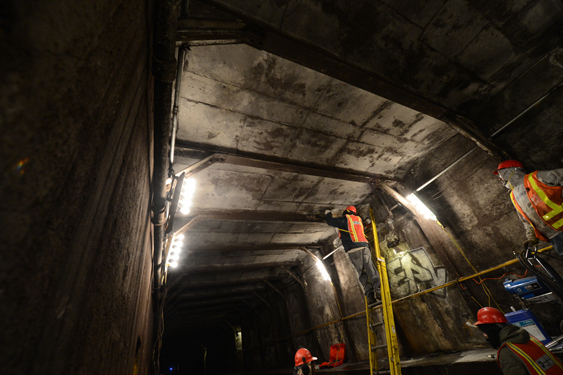 Repaired 530 feet of rubbing board, the fiberglass extension attached to the platform edge. Chopped 20 square feet and patched five square feet of concrete. Changed 356 station light bulbs and washed 346 fixtures, as well as ballast repair. Replaced 25 platform signs and installed 40 feet of drain line. Signals –Serviced 13 signals and four cut sections. Tested six signals. 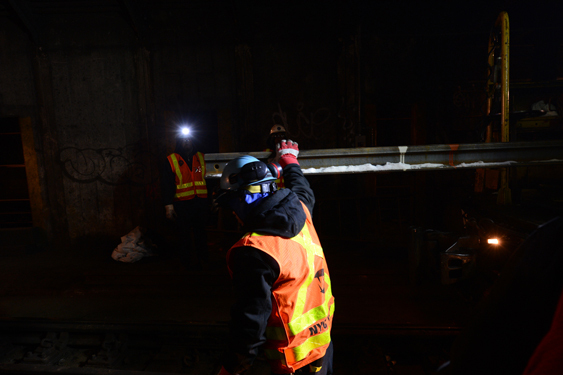 Performed maintenance at two rail/switch locations and completed testing, servicing, and repair work orders for other equipment. Electronic Maintenance – Serviced five CCTV cameras and four CCTV monitors. Performed maintenance of 14 public address/customer information systems, 78 speakers, and other equipment. 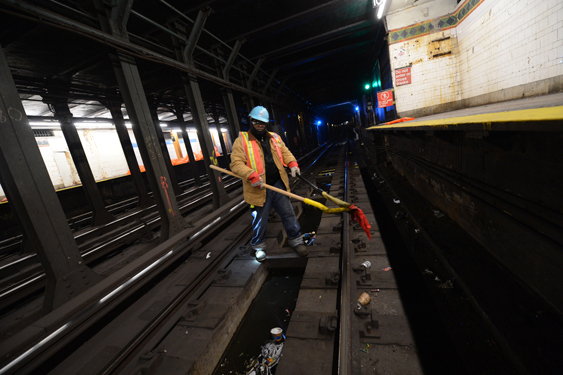 The FASTRACK program, which began in 2012, shuts down segments of a subway line for several hours over consecutive weeknights or weekend days, allowing employees to perform a number of critical repair, cleaning, and maintenance jobs. This approach has proven successful in that, under normal conditions in our 24/7 system, the scope and amount of important work completed would be impossible to accomplish with customers and trains moving through work areas. 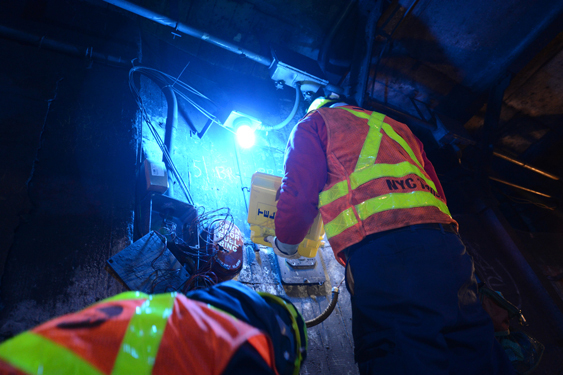 Tasks completed during FASTRACK have had a positive impact on train service with a reduction in train delays and a decrease in the number of track fires, while realizing cost efficiencies and a lower accident rate for employees. FASTRACK continues on the Pelham Line next week, January 12 - 16.